In our last post, we looked at the early beginnings of medium machine guns. We will continue to study this class of machine gun in this post. Before World War II, the German military came to the conclusion that static warfare tactics from World War I were obsolete and began to train using maneuver warfare concepts. Therefore, they needed a machine gun that could have a high rate of fire, but could be transported reasonably easily by hand, as well as used from a mobile platform. It was decided to design an air-cooled weapon with interchangeable barrels, so that it could fire rapidly for longer periods. The result was the MG 34 machine gun. MG 34 Machine Gun. Click on the image to enlarge. Public domain image. The MG 34 was used with great success by the German military in the early stages of World War II, but the rate of manufacture was slow because it needed some very precise machining to make it. Therefore, the German military held a new design contest for an improved machine gun and the result was the MG 42 machine gun. Interestingly, the winning design was submitted by a company with no previous experience in firearms manufacturing, but they had experience in mass production technologies and knew how to produce stamped machine parts (they made metal lanterns!) The lead designer, Dr. Werner Gruner, actually attended a military machine gunner's course to familiarize himself with machine guns and talked to soldiers about what they wanted to see in a weapon. 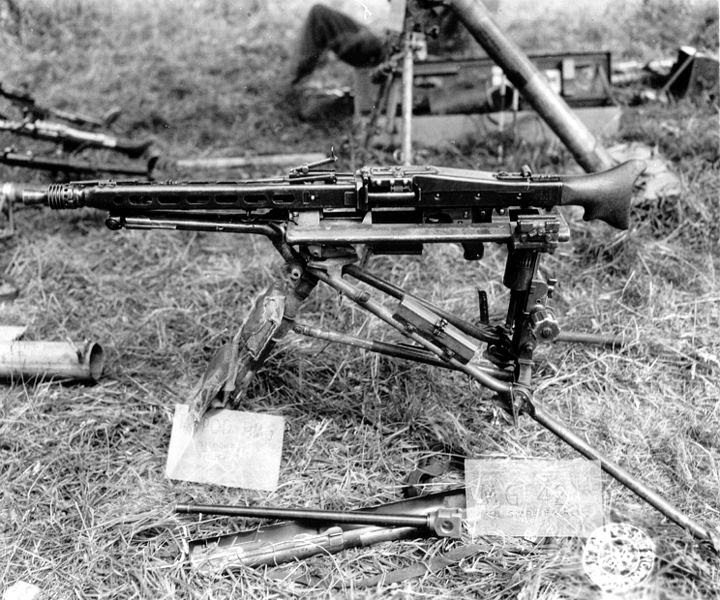 The resulting MG 42 design was much easier and faster to produce than the MG 34. It also had a much higher rate of fire (1200 to 1500 rounds/minute) than any other machine gun of that era. MG 42 on a tripod. Click on the image to enlarge. Public domain image. Like the MG 34, the MG 42 could be carried by a single user and operated with a bipod in a light machine gun role. It could also be mounted on a tripod (such as in the image above) and used by a team in a medium machine gun role. When used in a medium machine gun role, the optimum team size was six: a commander who directed the team, a no. 1 gunner who carried the gun and fired it, a no. 2 gunner to carry the tripod (which weighed about twice as much as the gun!) and three others to carry spare barrels, ammunition, entrenching tools etc. The first three team members also carried pistols for protection, while the other three carried rifles. Often, the team consisted of only three members though, a gunner, loader and spotter. The MG 42 was a very influential design and some variants continue to be used by military forces even in the present day. It also influenced other designs, such as the US M60 machine gun, the German MG 3 etc.